A version of this article first appeared in Hampshire View, June 2013. France’s Loire valley may be better known for Sancerre and Pouilly-Fumé, both made from sauvignon blanc, even for Muscadet at the mouth of the river, but chenin blanc is at the heart and soul of the Loire river. Chenin blanc is one of the most adaptable of grape varieties making styles from steely dry to lusciously sweet, and sparkling too. But it’s the dry styles that are edging their way up the trend trail. And not just from classic appellations such as Vouvray and Montlouis – dry chenin from Anjou and Saumur are increasingly being made dry and sophisticated. The grape variety lends itself to steely, dry, refreshing styles. In fact, in addition to these, it has many stylistic relations with sauvignon blanc. Both have naturally high acidity, which is preserved by growing it in the northerly Loire valley; both are more often than not made without oak, bottled in a vibrant, fresh, fruit-focused, pure varietal form. So both lend themselves to the trend that is refreshing white wine. Chenin blanc’s flavours differ from those of sauvignon blanc. Where sauvignon blanc can display strong varied citrus elements, chenin blanc tends more to apples, pears, melon, honey, floral notes with fragrant spices. 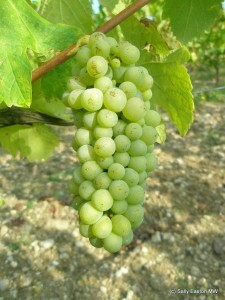 It tends to have more weight, texture, heft and volume in the mouth than many sauvignon blancs. But it’s quite a challenging grape variety to grow, which may explain why it hasn’t reached the popularity and geographical extent of sauvignon blanc, although South Africa makes some fine examples, in a different style again from the Loire valley. The variety has quite thick skins, which mean ripening goes on late into the season, especially somewhere as cool as the Loire valley. With this come all the usual risks of inclement weather, the increasing likelihood of rain, which is anathema to quality in the final stages of ripening. Berries are liable to burst as the vine roots take up the suddenly readily available water. Chenin is also quite vigorous, which means it needs plenty of attention through the growing season to ensure it doesn’t over-crop, another factor that detracts from quality fruit. Despite these issues, the flavours of the good wines are intense and palate-enlivening. And, though it’s probably impolitic to suggest it, given the challenges of ripening chenin blanc in the cool Loire valley, a little bit of global warming will really help its cause. Label says medium, but its racy acidity makes it taste drier, say off-dry. Really refreshing, apples, pear, melon, even a bit of runny honey. Really good value. Racy, dry Vouvray with real substance and length. Piquant apple fruits with steely, gunflinty notes. Rich, dry, apricot kernels, with acacia toast and a dynamic freshness and depth of concentrated spiced, poached peaches and a long finish.